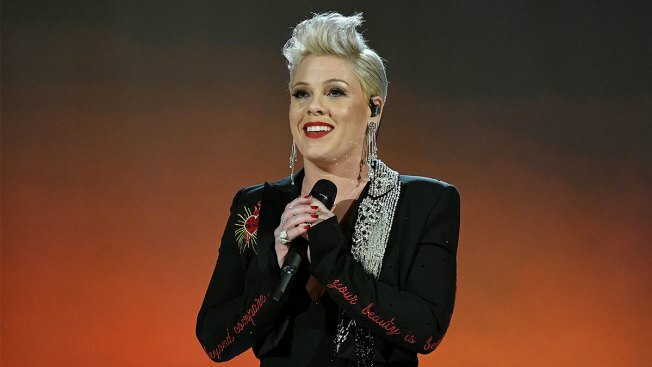 P!nk performs onstage at MusiCares Person of the Year honoring Dolly Parton at Los Angeles Convention Center on Feb. 8, 2019, in Los Angeles. Singer P!nk is in the middle of her 'Beautiful Trauma' Tour and took her family for a pit stop at Buc-ee's along the way! The pop star posted on Instagram Thursday morning photos of her and the family inside the Texas-sized travel stop. The post included the caption "Truck stops in Texas. Don't ask, just do it." However P!nk did not specify exactly which Buc-ee's location it was. One photo even shows the singer pushing a Buc-ee's shopping cart and wearing an adult onesie with the hood up. So far the post has been liked by close to 300,000 people. P!nk is performing in San Antonio Thursday night, Oklahoma City on Saturday and then she's back in Dallas on Sunday. So there's a good chance there could be another Buc-ee's visit in her future with all that travel time on I-35. You can check out her Instagram post below.